Boston Book Festival, Copley Square, Boston, MA Saturday, October 15, 2016 3:00pm – 5pm Maat Publishing at the NH Writers' Project booth. Epsom Public Library, 1606 Dover Rd., Epsom, NH Wednesday, October 5, 2016 7:00pm – 8:30pm No Fret Cooking presentation with music and food. Myrtle Street Gallery, Dover, NH Wednesday, August 24, 2016 & Wednesday, August 31, 2016 6pm - 9pm No Fret Cooking with music by Steve Carter, Frogstory Records participating at the first art, craft, and music event on Myrtle Street. Hampstead Public Library, Hampstead, NH Tuesday, July 12, 2016 7pm - 8:30pm Presentation, food samples, live music. Free and open to the public. Hampton Falls Free Library, Hampton Falls, NH Tuesday, May 10, 2016 6:30pm - 8:30pm An evening with ten local authors. North Hampton Public Library, North Hampton, NH Tuesday, January 26, 2016 6:30pm - 8:30pm An evening with ten local authors. Arlington Center for the Arts, Arlington, MA Saturday, December 5, 2015 6pm - 10pm A unique evening of books, writing, publication, music, and food! Victoria Inn, Hampton, NH Friday, November 13, 2015 6pm - 9pm Authors at the Inn. Boston Book Festival, Boston, MA Saturday, October 24, 2015 12noon - 1pm Maat Publishing will be featured at the New Hampshire Writers Project booth as part of the Boston Book Festival. Rice Public Library, Kittery, ME Wednesday, October 14, 2015 6pm - 8pm No Fret Cooking Presentation, Q&A, book signing, live music, food samples. Silver Fountain Inn, Dover, NH Sunday, October 25, 2015 2pm - 4pm Two Authors and a Guitar. Poetry reading with a little jazz. Features Steve Carter and Layne Case. Portsmouth Public Library, Portsmouth, NH Wednesday, September 16, 2015 6pm - 8pm Matt Publishing will have a table at the Local Author Fair, featuring No Fret Cooking and Intermodulations. Danversport Yacht Club, Danvers, MA Wednesday, July 29, 2015 4pm - 9pm Matt Publishing will have a table at the New England Authors Expo. Toadstool Bookshop, Milford, NH Friday, June 12, 2015 6:30pm - 8pm Presentation, Q&A, book signing, live music, food samples. Barrington Public Library, Barrington, NH Wednesday, May 20, 2015 6:30pm - 8pm Presentation, Q&A, book signing, live music, food samples. Maple Suites, 30 Holiday Drive, Dover, NH Sunday, May 17, 2015 2pm - 4pm Authors Tea. Marilynn will discuss No Fret Cooking. Steve will play some music. Plum Island Coffee Roasters, Newburyport, NH Thursday, May 14, 2015 6:30pm - 9pm Merrimac Mic Poetry Series. Marilynn will read from No Fret Cooking. Steve will play some of his music from the cookbook CDs, and he'll read from his book of poems, Intermodulations. Victoria Inn, Hampton, NH Wednesday, May 6, 2015 6pm - 9pm Authors at the Inn. 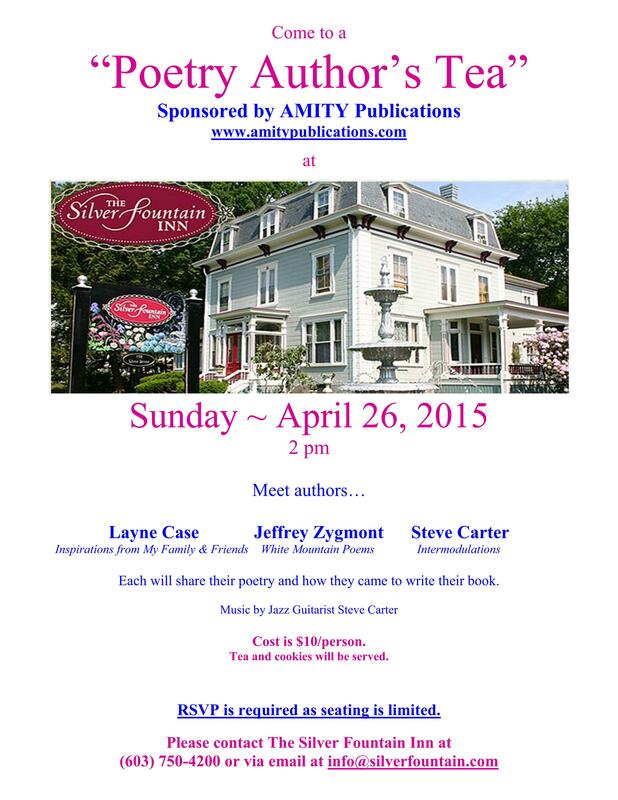 Silver Fountain Inn & Tea Parlor, Dover, NH Sunday, April 26, 2015 2pm - 4pm Steve will one of the featured poets at the Poetry Authors Tea. He'll read from Intermodulations. Victoria Inn, Hampton, NH Saturday, April 25, 2015 11am - 4pm We'll have a table at the Shop and Sip event.